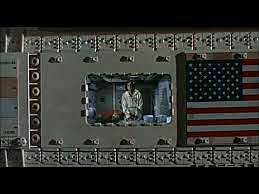 The order comes from exhausted, ravaged Mother Earth, to nuke the space farms, but Bruce Dern (a man born with a contrary face) prefers to treat that order as garbled in transmission. 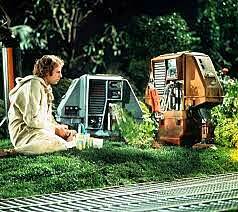 This is the first and best of the Green Space Operas. Trumbull, the special effects guru (2001, Close Encounters of the Third Kind) goes wild in his directorial debut: the space farms and incidental craft are an art-direction triumph; his droids (Huey, Dewey and Louie) are far more charming than those rusty, effete and annoying Wizard of Oz knock-offs from Star Wars (which P, incidentally, considers a franchise fit only for merchandise-hungry morons and TV dipsos), and the long shot of Bruce at the ‘kitchen window’, washing his precious vegies, is a stunner.